She stuck the landing! Photo courtesy of Kate Chadderton. The save of the week officially belongs to 10-year-old Isabella. 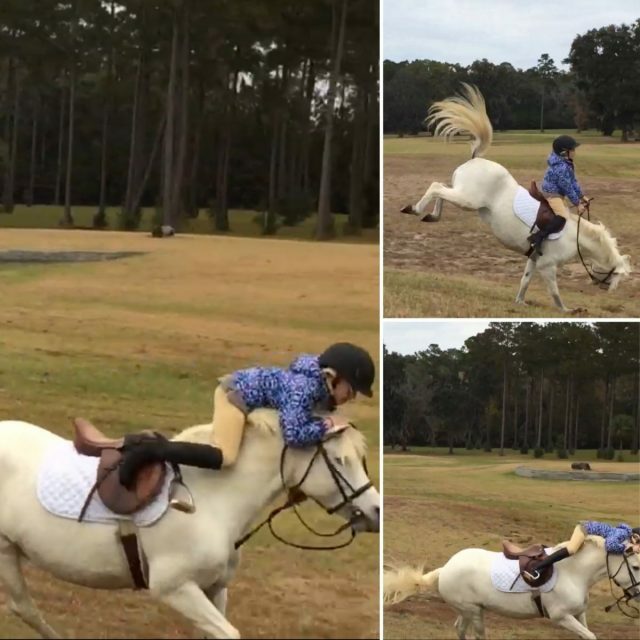 All was going well for Isabella this weekend as she enjoyed a clinic with Kate Chadderton, until her pony decided to show off a few bucks while going downhill. Kate says Isabella handled the ordeal with grace and continued on like nothing ever happened. Something tells me she’s ridden other bucks like this before. Speaking of clinics, are you teaching or hosting one this winter? Email us the details at [email protected] for inclusion in our “What’s Happening” events calendar. Events Opening This Week: Full Gallop Farm January H.T; Rocking Horse Winter I H.T. Looking for a working student this winter? Email us the details at [email protected] for inclusion in our next roundup of available working student positions.